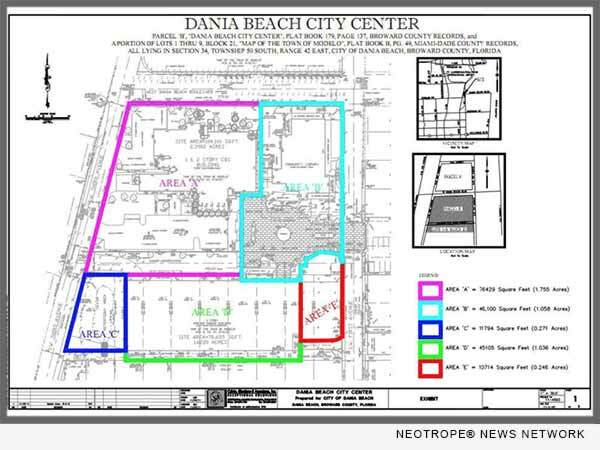 The Dania Beach Community Redevelopment Agency (DBCRA) invites interested parties to participate in a public private partnership and submit qualifications (RFQ) for the redevelopment of property known as the Dania Beach City Center. This 4.5-acre site is owned by the City of Dania Beach. (DANIA BEACH, Fla.) -- NEWS: The Dania Beach Community Redevelopment Agency (DBCRA) invites interested parties to participate in a public private partnership and submit qualifications (RFQ) for the redevelopment of property known as the Dania Beach City Center. This 4.5-acre site is owned by the City of Dania Beach. A primary focus of the DBCRA has been to create a vibrant mixed-use center in the downtown that will serve as an activated central gathering place for residents and visitors alike. Redevelopment of the site should include a new City Hall Facility and a Park/Open Space that incorporates sustainable elements, as well as market rate, multi-family housing. The City of Dania Beach is experiencing revitalization in both the immediate downtown area and the surrounding area. Multiple hotels and residential units are under construction and less than one mile from the City Center site is Dania Pointe, a $900 Million mixed-use project currently under construction. The City Center site is conveniently located near I-95, Fort Lauderdale/Hollywood International Airport, Port Everglades, and the Casino at Dania Beach. The CRA is also working on downtown redevelopment projects which include a multi-million dollar streetscape improvement project to enhance the City Center. The City Center Site has great potential to become a transit-oriented mixed-use development due to its close proximity to the Florida East Coast ("FEC") railway and to the proposed Tri-Rail Coastal Link commuter rail system and station. The new mixed-use "City Center" will include retail, office and residential uses, and should incorporate the City parking garage structure that was constructed and completed in 2011. Interested firms may secure the solicitation package and all other pertinent information by visiting http://daniabeachfl.gov/bids.aspx?bidID=200 or DemandStar.com. * Questions regarding this solicitation shall be submitted in writing to the CRA Consultant through jenae@rma.us.com no later than 5 p.m. on August 24, 2017. * The closing date and time deadline to submit RFQ responses is 2 p.m. ET on September 22, 2017. For more information on the Dania Beach Community Redevelopment Agency, contact 954-924-6801 or visit http://www.daniabeachcra.org/.